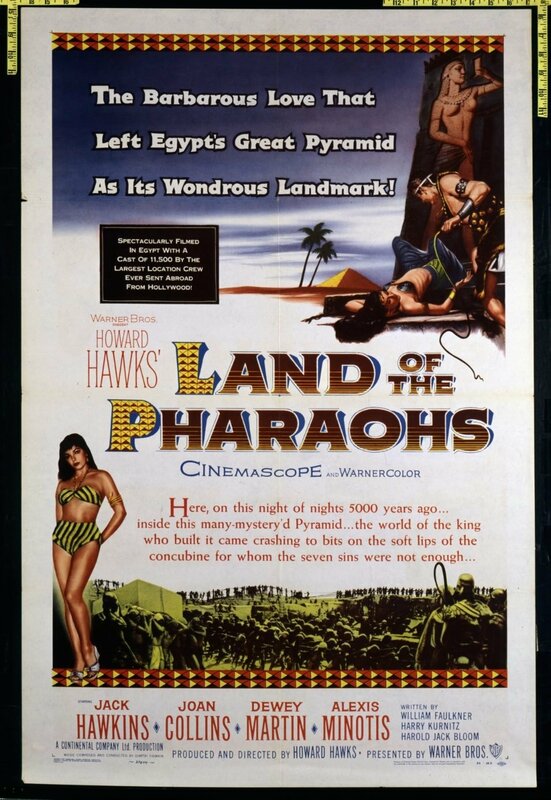 In Ancient Egypt, single-minded Pharaoh Khufu (Jack Hawkins) hires an enslaved architect (James Robertson Justice) to design a full-proof tomb that will secure his body and belongings for the after-life — but his second wife, wily Nellifer (Joan Collins), longs for his riches, and plots with her lover (Sydney Chaplin) to kill Khufu and his first wife (Kerima) and son (Piero Giagnoni). Peary writes that this “mediocre milepost in Howard Hawks’s otherwise brilliant career” has a cult “among adults who saw [it] as kids and were excited by such sights as a bunch of bald, tongueless priests allowing themselves to be buried alive in a tomb; some cowards being hurled into an alligator pit; and statuesque beauty Joan Crawford displaying a bare midriff”. However, he concedes that “seeing it today, few will disagree that it’s just another silly, stiltedly acted historical epic”. While there are impressive crowd scenes, there are “no expensive battle sequences to take advantage of CinemaScope; the cast is second-rate…; the make-up is bad”; and the storyline “lacks intrigue, suspense and visual elements”. Land of the Pharaohs remains of interest simply because “it was Hawks’s most ambitious project conceptually”, requiring “10,000 extras, 50 days filming in Egypt, and the simulated construction of the base of the great pyramid” — and the “entombment finale (with pouring sand and sliding blocks) remains truly spectacular.” But overall, as Peary himself concedes, “this is a pretty dull film that only… longtime fans can really enjoy”. Yes, once, as a cult favorite. Discussed at length in Peary’s Cult Movies. A once-must, for its place in cinema history…and for its scale and its undeniably exciting/creepy finale. Oddly, I don’t really find this movie all that dull – maybe that’s because I’m intrigued by the subject matter; it’s just too weird a time not to be fascinated by. ‘LOTP’ sits kind of comfortably in (pagan) contrast to the biblical epics of its time. I’m no historian, of course – and most audiences will speculate about how much of the film was actually researched (apparently a good deal was) – but it’s certainly an era worthy of attention, regardless of how much of what is presented is accurate. Hawks’ film also stands decidedly apart from something like ‘The Ten Commandments’ – which would be released the following year – in that it has no camp value. (‘TTC’ is full of camp.) Oh, sure, Joan Collins has a couple of lines that are giggle-worthy…but, basically, the film is too even-tempered a document, so it is saved from anything like DeMille’s tendency to over-cook (even if the two films share an overall similarity of tone). I wouldn’t really agree that the film is badly acted. The real issue seems to be that, given the kind of script the cast was working with, there wasn’t a whole lot to act. There isn’t much by way of real…drama. We’re essentially watching a film about architecture. There is a tiny bit of intrigue but the general concerns of drama are given the heave-ho. Audiences expecting such staples could easily find their minds wandering. Admittedly, the film is more a cinematic curiosity than anything else. But, personally, I wouldn’t call it a bore. I think it has a distinction that makes a single viewing worth the time. That unforgettable ending alone (!) makes it one to see.